A life drawing class will be held on Tuesday, 5 December 2017, at the Art House, Southport. Classes run from 6pm to 9pm and cost just ₤15 for the session. 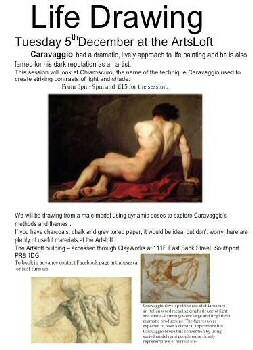 People attending will be drawing a male model and using dynamic poses to explore Caravaggio's themes and his use of the technique - chiaroscuro. If you have charcoals, chalk and grey toned paper, it would be ideal, but don't worry there are plenty of useful materials at the Artsloft The Artsloft building; accessed through ClayWorks, at 111B East Bank Street, Southport, Merseyside, PR8 1DG. To book in advance contact them via their Facebook Page - Art House Southport or just turn up!